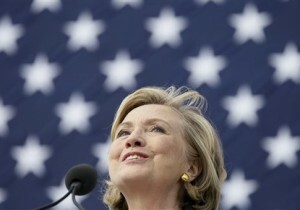 Hillary Clinton will be headlining a fundraiser for Sen. Mary Landrieu (D., La. ), who recently pushed for Democrats to pass legislation allowing the Keystone XL pipeline, just hours before she headlines a fundraiser for the League of Conservation Voters, which is using all its resources to fight the pipeline. Hillary Clinton will raise money in New York City on Monday evening for embattled Democratic Sen. Mary Landrieu, who supports construction of the Keystone XL pipeline and opposes President Obama's greenhouse-gas limits on coal-fired power plants. A few hours later, Clinton will be the featured speaker at another New York fundraiser, this time for the League of Conservation Voters, a group that's battling Keystone and is fighting to preserve Obama's climate-change regulations. Being the presumptive Democratic front-runner is complicated. Clinton has stayed mum about her views on Keystone despite growing pressure from progressives, while she's on record with general praise for Obama's climate agenda.